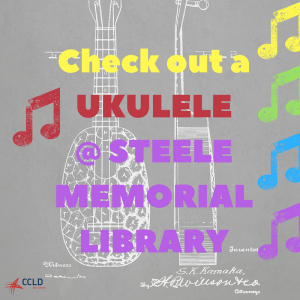 The ukuleles are now ready to circulate at the Steele Memorial Library. They may be checked out at the second floor information desk. People must be STLS card holders in good standing (less than $5 in fines) and 13 years old or older. To place a hold on a ukulele, please call (607) 733-9175 to add your name to the list. Users must come into the Steele Memorial Library, to the 2nd floor, to check them out. The instruments must be returned in person to the 2nd floor desk at the Steele Memorial Library. Below please find some ukulele books to aid your new skill. Our ukulele class was very popular. Please stay tuned as we are working on scheduling another series of classes at the Steele Memorial Library. Ukulele for dummies by Wood, Alistair. Pink Floyd for ukulele. by Waters, Roger, composer. Grateful Dead for ukulele.by Grateful Dead (Musical group), composer, performer. Bob Marley for ukulele.by Marley, Bob, composer, performer. Mel Bay’s Fun with the ukulele.by Bay, Mel, 1913-1997. This entry was posted in Steele and tagged Ukulele by Maggie Young. Bookmark the permalink. ← Previous Previous post: Chemung County Officials: Where’s your district and who is running?